I have been fortunate enough to get professional photographs as I went along. Those first got me into the card business. I was accepted as an artist for the Constance Kaye Company. At the time they were offering no black images. I hand mounted these photographs for several years, learning as I did so. It seems like ancient history because there were so few products to help. No Martha Stewart glues and circle cutters. I had help of a friend who also designed jewelry with me. At some point I started painting cards. These hit a more general audience, but challenged a not so precise painter to make hundreds of duplicates. So far so good. And then Disney opened its Times Square store. I was selected to provide original cards of Minnie and Mickey Mouse, a thousand at a time! That’s when I hired staff. I worked for this card company for about 7 years. But now with this new affiliation, people I know only through WordPress, Facebook, Twitter and the general public can see my work, buy the originals if available, or order reproductions. Over 600 times the site has been viewed. I HAVE MADE SOME SALES! The prints on paper, canvas or acrylic as well as notecards are all handled beautifully by the company. 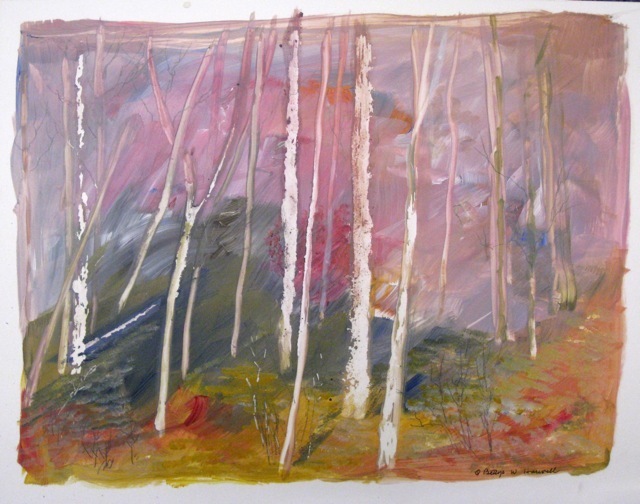 The Birches (above) sold recently to a private collector. My studio is located in a framing gallery and so we were able to provide that service also for original work. I think every question deserves an answer. I also want to share my good finds with others. I have encouraged others who have also joined this company. Professional artists and online experts learn to evaluate what works for them. It may not work for everybody. You need excellent photographs and tags to bring interested people to your website. And we are finding that we must remember to be cautious in evaluating public response. I like the comments people leave. It shows they were engaged even when criticizing. I like the give and take with real people. But there are questionable people online. I feel terrible when my suggestions do not work for someone else, but I should not. I only can say that there are discussions within the company where questions can be asked and help given. And wish the collectors and artists well with their businesses. Artists are listed by name. There are other categories which may be of special interest to you. Just like blogging, I will be adding so you will come back often! It looks like many folks are using the site for inspiration. You can comment thereto let me know if you like my work. If you are a member, I will look-see your work. Women’s magazines explain how to get organized so that all the household chores can get done. They suggest what to do each day, weekly, monthly and so on. It never worked for me. Cleaning a closet meant emptying things onto the bed. (Made or unmade?) Probably with the sheets thrown down the handy shute or stairs. And there is where the problems began. Diversions to try on clothes to save or discard. Answer the phone. Read an old magazine. Answer the phone. Lunch time. All the way to bedtime. And the sheets are off the bed! And all of the closet things are piled on the bed! Hardly a few inches left to lay my head down. Not a pretty picture. Did I say I started a new painting after lunch? Surely, no one else has had days like this. Six months ago, I did not know how much pleasure blogging would be. The writing gives an outlet for the ramblings of my overactive mind. More importantly, I have followed and learned from so many interesting people around the world. That little map WordPress has added tells it all. I first heard of the internet when some graduate students offered to let me use their library privileges. At the time, I owned the dark-ages Osborne computer with a 5″ screen. I could not get my head around the possibility of reading directly from the university library. The explosion of knowledge digitized since then is equally hard to believe. When my grandchildren ask “Were you born before the automobile?” I will share with them my tech history. So there.